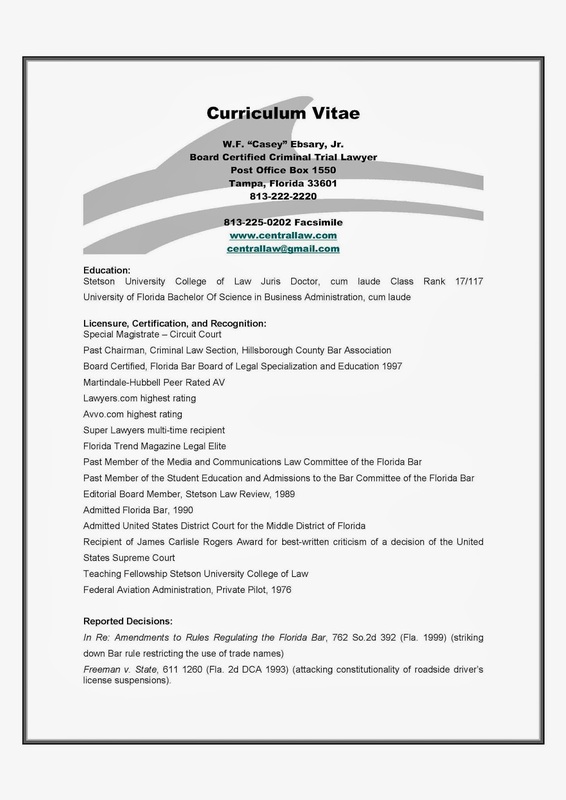 Resume of Tampa Criminal Defense Attorney | W.F. Casey Ebsary, Jr.
Attorney W.F. “Casey” Ebsary, Jr.
Freeman v. State, 611 1260 (Fla. 2d DCA 1993) (attacking constitutionality of roadside driver’s license suspensions). +Law Office of W.F. 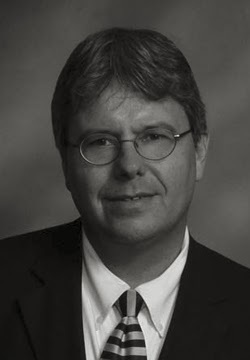 ”Casey” Ebsary, Jr.
Board Certification in Criminal Law Review, Florida Association of Criminal Defense Lawyers, 1998 to 2008. Liability and Exposure from Use of Email and the Internet, Hillsborough Community College, 2002. Legalities of Using and Maintaining Computerized Medical Records, 2003, Tampa, Florida. The Practice: Everything Else You Need To Know About Criminal Defense; Palm’s and PC’s, 2002, Tampa, Florida; Florida Association of Criminal Defense Lawyers. Internet Research in Florida, Tampa, Florida, 2001. Ebsary, “Paper-less Office or Less-paper Office”, Lawyer, Mar. 2003. Ebsary, “Secret Messages that are not Secret”, Lawyer, Dec. 2002. Ebsary, “Securing a Cable Modem Against Computer Criminals”, Lawyer, Oct. 2002. Note, Fourth Amendment Aerial Privacy; Expect the Unexpected, 19 STETSON L. REV. 273 (1989). Recent Developments in Section 1983, 19 STETSON L. REV. 1065 (1990). Matias, K, “The Talk of the Web”, On Magazine, Dec. 2001 (coverage of defense of Internet libel claim). Talk about your stunned silence; just the facts, ma’am and whatever happened to casing a joint? What about the Feds on Twitter? Most Twitter multimedia is handled by 3d party links. Twitter allows both public or private updates. On Twitter Direct messages are private and the sender can delete these messages. the feds noted that short URLs used to serve malicious links and code. Today we learned the feds will seek to recover direct messages and that when Twitter receives the request, they will comply and disclose that such a request has been made. Tampa Criminal Defense Expert, W.F. ”Casey” Ebsary, Jr., has suspected that cops use “fake identities” to “trick” users into accepting a government official as friend or otherwise provide information to the government. We believed that the feds watch Facebook, MySpace, Twitter, Flickr and other online social media and use the information for investigative (criminal or otherwise) or data gathering purposes. Guides, manuals, policy statements, memoranda, presentations, or other materials explaining how government agents should collect information on social networking websites: how or when government agents may collect information through social networking websites; procedures government agents must follow to collect information through social networking websites; agreements with social-networking companies: using any visualization programs, data analysis programs or tools used to analyze data gathered from social networks; purchase orders for any visualization programs,data analysis programs or tools used to analyze data gathered from social networks; describing how information collected from social-networking websites is retained in government databases or shared with other government agencies. The feds produced a 33 page record. We just took a look at it and it appears to be a training program. 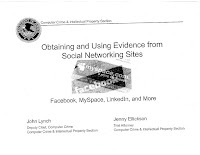 The document was titled, “Obtaining and Using Evidence Social Networking Sites from Facebook, MySpace, Linkedin, and More.” It was authored by John Lynch, Deputy Chief, Computer Crime and Jenny Ellickson, Trial Attorney of the Computer Crime and Intellectual Property Section. How can Law Enforcement Obtain data from these sites? How do the Feds get information from Facebook? Since the Facebook Data is organized by user ID or group ID they use these resources: Data productions using the Fed’s Law Enforcement Guide includes Neoprint, Photoprint, User Contact Info, Group Contact Info, and IP Logs. The feds noted that “Facebook has other data available.” and that Facebook is “Often cooperative with emergency requests.” That means that the feds can claim urgency and shourtcut the time frames that are usually present when legal production of this information is sought. What do the Feds Think about MySpace? The feds noted that MySpace is owned by Fox Interactive Media and was the most popular Social Network; was passed by Facebook in 2008; True names are less encouraged than Facebook. Feds are noting there is Messaging through messages, chat, friend updates. MySpace has a Young user base,has a history of child safety concerns, and Privacy is currently less granular than Facebook. Cybercrime defense attorney notes that Granular Privacy Controls in social networks allow authorization profiles – the user gets to decide what data to show to other friends in the network. How do the Feds Get Info From MySpace? The Feds know that many profiles have public content and thatData is organized by Friend ID. Notably, MySpace requires a search warrant for private messages or bulletins that are less than 181 days old. MySpace considers friend lists to be stored content and there are fixed Data retention times for User information and stored files. MySpace retains IP logs indefinitely and information for deleted accounts is kept for a year. What the Feds believe about Twitter? Twitter is the market leader in “micro-blogging.” Most Twitter multimedia is handled by 3d party links. Twitter allows both public or private updates. On Twitter Direct messages are private and the sender can delete these messages. the feds noted that short URLs used to serve malicious links and code. How do the Feds Get Information from Twitter? The good news for the Feds is that Most Twitter content is public and Private messages are kept until the user deletes them. The bad news for the Feds is that Twitter only retains the first login IP, there is no user contact phone number, Twitter Will not preserve data without legal process, and Twitter has a stated policy of producing data only in response to legal process. The feds use LinkedIn to identify experts and check the background of defense experts. The Privacy model is similar to Facebook and Profile information is not checked for reliability. The Feds note an upsurge in federated identity schemes. Social networking sites are increasingly adopting federated identity schemes such as OpenID, Facebook Connect. They write of concerns that Facebook, MySpace, Yahoo!, and Google authenticate identity and signin across platforms. They give the following Example: A user can log in to a Facebook account using Google credentials. After a link is established between two accounts, Google will check and vouch for identity of its user. Authentication information split from activity information. In turn, a Facebook login may be used to authenticate. The feds also are concerned about the growth of social networks and the questions it raises about the breadth of the PPA. This author notes that the Privacy Protection Act provides for criminal penalties against federal officials who willfully disclose a record in violation of the Act, 5 U.S.C. § 552a(i)(1).